In support of their self-titled debut EP, San Diego CA hard rock / heavy metal duo Tzimani is heading out on one final tour before the end of the year, a two-week run starting November 7 in Las Cruces NM and ending on November 20 in Los Angeles CA. 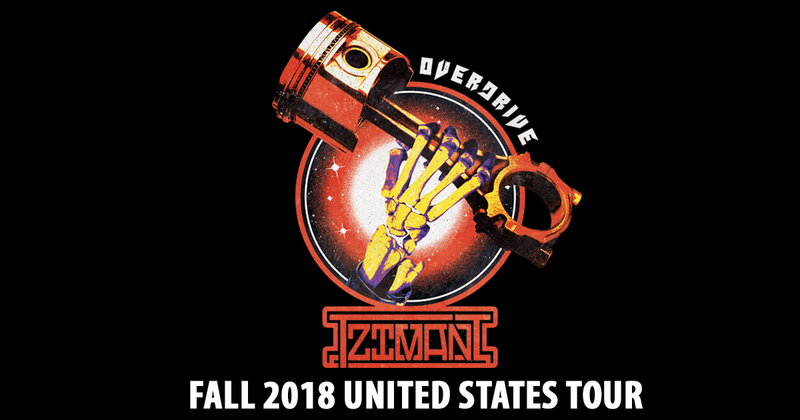 Since the March 2018 release of the 6-track debut EP, Tzimani has completed two North American tours and played several high-profile regional shows to bring their fresh, unique brand of feelgood heavy music to life, and will head out on the road one more time this year, on a quest to conquer unchartered territories as well as reconquer familiar ones. With each show, Tzimani has not only garnered an ever-growing fan-base, but in the process the band has also been building the foundation for a self-coined niche sub-genre, “trad mod”, essentially a bold new take on traditional heavy metal which infuses modern elements into old-school stylings that have existed for more than four decades, and giving listeners catchy, memorable tunes that leave a long-lasting impact but are not simply a regurgitation of things already done to death by countless bands over the years. Tzimani stands on the perfect middle ground between the old school and the new school of heavy music, and has the ability to make the same kind of instant impact on fans of both styles. The band’s live performances also reflect this special quality, as the music itself exhibits some of the old-school tendencies, while the two-piece setup gives it a modern feel which separates Tzimani from your run-of-the-mill traditional metal revivalist bands. While the debut EP is still fresh and needs to be discovered by large sections of the world of heavy music, Tzimani has plans for some very exciting new studio releases in the near future. More shall be revealed on that front very soon, but in the meantime, crank the Tzimani self-titled EP, catch them at a show, and shift into overdrive! Based out of San Diego, California, Tzimani (pronounced “Si-maani”) was formed in 2017 by brothers Eddie Vazquez (guitar, bass, vocals) and Sebastian Vazquez, and has quickly made waves in the underground hard rock / heavy metal circuit, circulating rapidly as a breath of fresh air in the modern-day musical atmosphere. Catchy melodies, scintillating guitar leads, groovy rhythmic patterns and soaring clean vocals punctuate songs that force listeners to instantly hit “Repeat” and be left wanting more. Taking natural influence from listening to the classic hard rock and traditional heavy metal through their upbringing but not consciously attempting to be a revival band, Tzimani infuses elements from other sub-genres and adds a modern touch to their brand of heavy music, self-coined “trad mod”. With an ambitious attitude since day one, Tzimani is by on means a weekend warrior band. The duo released their first two singles in 2017 and toured the Western US in 2017 to promote their newly formed sound. In 2018, they completed two more tours, hitting parts of the East Coast for the first time, as well as playing their first Canadian show, to a rousing reception and unanimous approval from the metal-loving crowd in Vancouver BC. With the Fall 2018 tour, the band ventures to hit yet more new markets including the mid-West. Across their travels and regional appearances, Tzimani has shared the stage with several established national and international touring acts, such as Swedish groups Avatar and Truckfighers and fellow American bands Mothership, Huntress and Vicious Rumors. Tzimani is signed to Noize Cartel Records for digital distribution, but the band self-released the debut EP on all physical formats, CD, vinyl and cassette. Tzimani is also featured on the No Legacy vinyl compilation, produced by Erik Kluiber (Void Vator / ex Gypsyhawk), showcasing nine of “the finest underground heavy bands from Southern and Northern California”, according to Kluiber. Keep your eyes and ears peeled for Tzimani as they gear up to continue storming through the scene on a headstrong mission to leave an indelible stamp on the genre with their signature sound and unique performances!